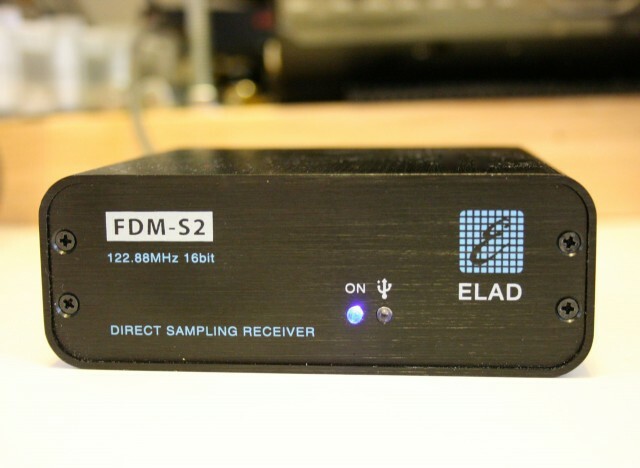 “Thanks for your excellent review of the Elad FDM-S2. I bought one and received it yesterday. I tried out the software earlier this week by downloading 4GB of sample files from DK8OK and the Elad software. There are a lot of interesting features. It is small! I like the use of the USB port for power. I can see how it would be a good receiver to throw into your laptop bag for trips. I have a harsher Urban RF environment with 5KW and 1KW AM Broadcast transmitters within 2.5 miles. They reduce power at night. The Wellbrook AHA1530 Loop outputs a very high signal level from all the area’s AM stations. I have to use the attenuator on any radio at my QTH below about 2.5 MHz. The unit having one preselection filter for LW/MW/HF is noticeable as I got ADC Clip warnings when directly connected to the Wellbrook loop. Turning on the 11 dB attenuator took care of the problem and did not seem to affect the weak signals much. It also was not as bad when I connected a Mini-Circuits ZFSC-2-6+ two port splitter between the Elad and the Wellbrook. The Perseus has multiple preselection filters, but I noticed only one low pass filter for the 0 to 1.7 MHz range. So a MW band reject filter would be useful for Long Wave with both units. I plan on building an external preselector. The option for multiple receivers and two RF ranges is pretty neat. I was listening to multiple FM stations at once. This morning I set one range to 31 meters and the other to 49 meters. I listened to Radio Australia on 9580 KHz using the right laptop speaker for audio, and could check their other frequencies on 31 and 49 meters using the left laptop speaker for audio. I do HF Utility monitoring on digital signals, so I want to setup the Elad software with external decoder software. I have seen reports that the Elad can receive Airband pretty good, so I will also try receiving and decoding multiple ACARS frequencies at the same time. Thanks for sharing your experience, Eric! Since I live in such a rural area, I never have to worry much about low pass filters (though I’m sure they couldn’t hurt). I’ve had the FDM-S2 since June this year. I can tell you that there are so many features, settings and possibilities with this radio, you could easily spend the winter and spring experimenting. I have yet to use the WinRad app to drive the S2. Eric, we welcome any other discoveries you make along the way! Many thanks! This entry was posted in AM, New Products, News, Radios, Shortwave Radio, Shortwave Radio Reviews, Software Defined Radio and tagged ELAD, Elad FDM-S2, Eric Cottrell, FDM-s2, FDM-S2 Strong AM, Shortwave Radio Reviews on December 4, 2014 by Thomas.